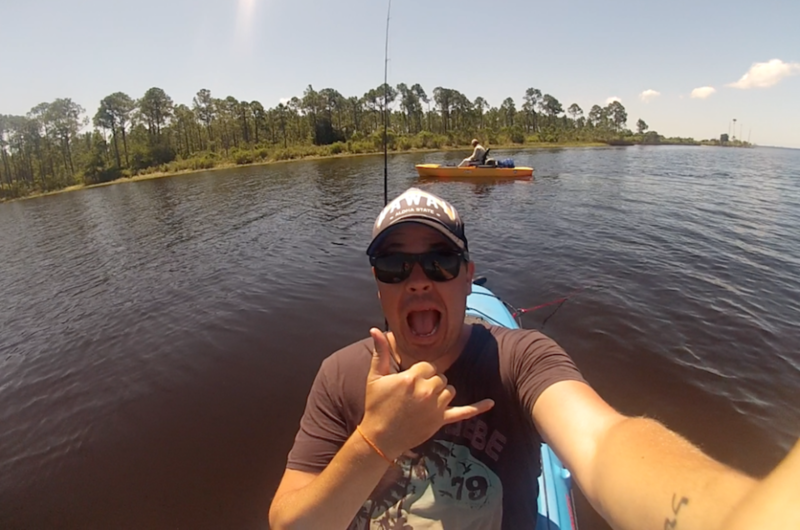 Have you ever heard of Kayak Fishing? 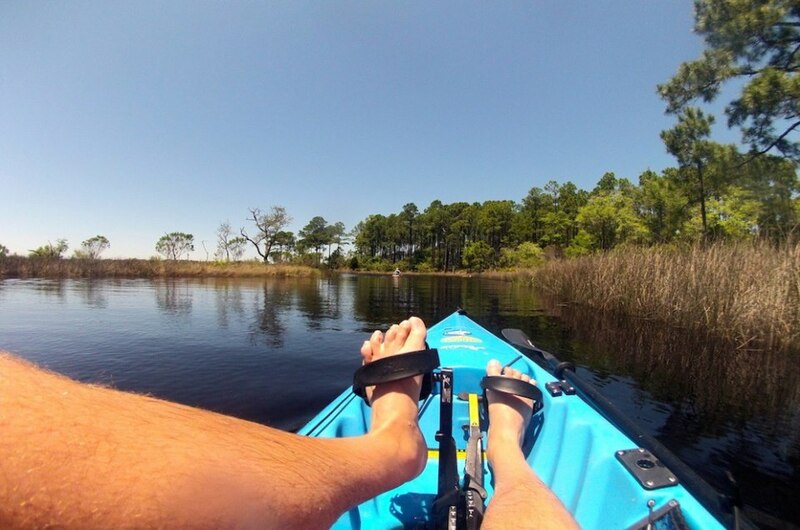 Five minutes after pulling into a parking spot at Burnt Mill Creep Boat Ramp, I was already slipping into a Hobie kayak when I noticed the boat had been outfitted with pedals. “Oh, now we’re talking,” I said to Nathan, who would be my guide for a halfday of kayak fishing. Nathan pushed me off, and I began to glide across the water with much more speed than in a traditional paddle kayak. Nathan and the team from Bay County Outdoors had already loaded my kayak with everything we’d need, and had even scouted the best inshore pockets where the fish were biting. We pedaled toward a cove—it’s much easier to pedal a boat than a bike—dropped anchor and cast our lines. 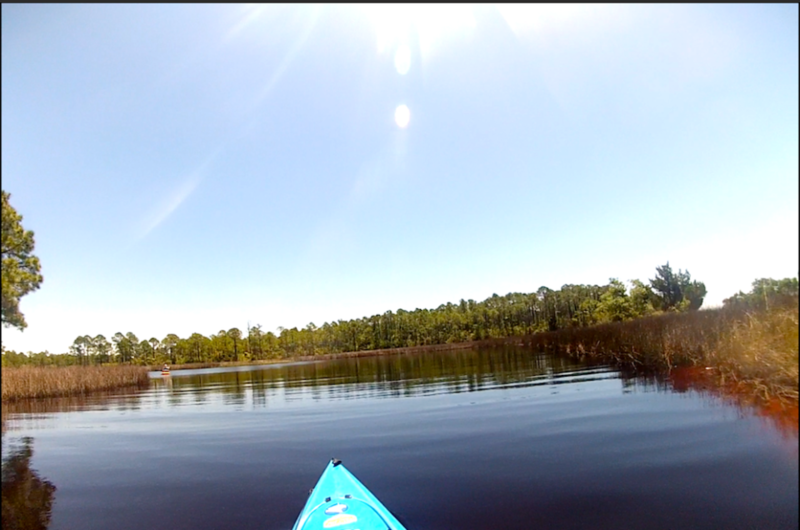 I felt myself relax as I sat in the kayak, surrounded by water and the serenity of nature. I caught my first fish before Nathan caught his (a fact I’m proud of), but it was an unexpected twist 30 minutes into our trip that gave me the biggest thrill. We were pedaling a couple of miles down the bay when I heard a sound about 50 yards to my right. I looked to see a small pod of dolphins swimming together. I glanced around to see we were the only vessel on the water for this inshore dolphin show—a tranquil glimpse of nature that wouldn’t have been the same on a fishing expedition. After the private show, I was able to check ‘watch dolphins play’ off my PCB Bucket List. Throughout the afternoon we continued to kayak a few hundred yards at a time, drop anchor and let the tide move us down a bay before pulling in our lines and moving again. By end of our trip Nathan was guiding me through some narrow waterways a motorboat wouldn’t have been able to access. I began to appreciate my newfound hybrid sport. For one, it costs less and leaves a smaller footprint on the environment. But for me, my day fishing around the nooks and crannies of Panama City Beach was all about going where a traditional boat couldn’t quite go. I had wanted to experience something different, something unique, on this trip, and this was it. Apply and take sunscreen. Learn from my mistake of lathering my arms and face, but forgetting to lather and carry the sunscreen with me out on the water. Take a waterproof camera and have a waterproof case for your phone. Take a small waterproof bag for sunscreen, snacks (although Nathan had snacks/drinks for me), your waterproof camera, and anything else you’d like to take. The kayak isn’t so small that you can’t bring anything with you, but not so big that you’d want to bring a large backpack. Use the bathroom before you go. I think this is a given. Consider leaving a tip for your fishing guide. My guide, Nathan, had previously scouted out the location and then took me through narrow waterways I wouldn’t have been able to just access on my own. It wasn’t about how many fish we caught, but rather his time and work in making sure it was the best experience possible.